If you haven’t yet seen this must-see, deeply philosophical, thought-provoker, here’s your chance. 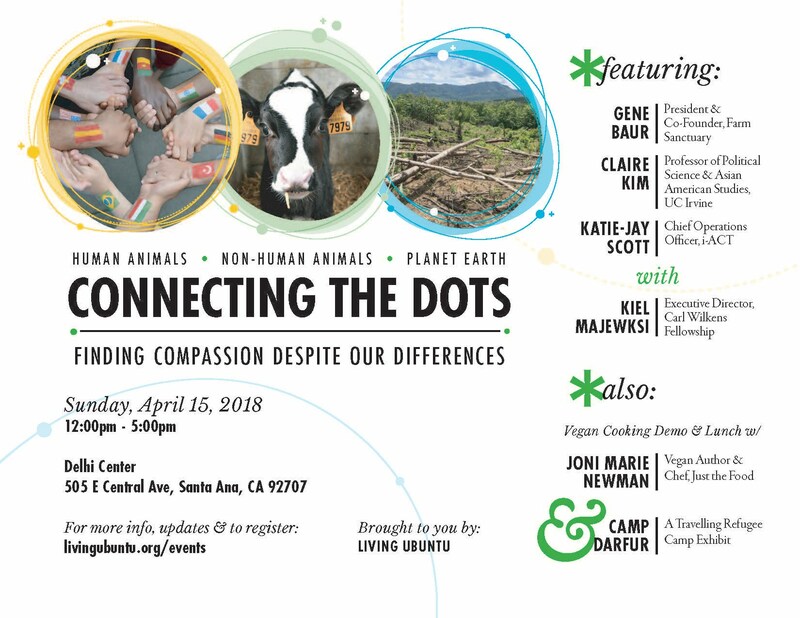 A Screening of Speciesism with filmmaker Mark Devries will be hosted by the Golden West College Peace Studies Program, Thursday, April 20, 6:30pm – 9:30pm. RSVP. This screening is the pre-conference kick-off event, in advance of the Friday, April 28, 8:30am – 5:00pm 11th Annual Golden West College Peace Conference: “A Sustainable Peace: Equity, Equality, and Environmental Interdependence in the 21st Century”. This year’s intersectional theme is well represented in the broad variety of speakers, a line-up that won’t disappoint. The $25 pre-registration includes vegan breakfast and lunch, plus the full day conference. As in past year, the event is zero waste. PRE-REGISTER. The day before the GWC conference, we will be out at Cal State Fullerton for the Thursday, April 27, 6:30p – 8:30pm Socially Accepted Practices and Traumatic Impact on Adolescents’ Development.We will have a very interesting conversation that night with special guest Gene Baur, plus Dr. Nicole Jafari, and Fullerton residents, Bruno Barba, Dulce Barba and Audrey Waight, (all featured in our yet to be released documentary, ‘So Give Me An F’). Admission is free. RSVP. The day after the GWC conference we will be in Irvine for the Saturday, April 29, 9:00am – 4:00pm Crises in the Ocean: How Compassionate Action Benefits Us All, Featuring Gene Baur, Jonathan Balcombe and Kate Mackey, plus a vegan cooking demo by Joni Marie Newman and compost demo by John Craig. This free event includes lunch, so after you see how Joni made the yummy tacos, you will get to eat them. And Gene and Jonathan will be signing books that day. After the morning and mid-day program, People’s Climate March – Orange County will commence at 2p. RSVP. Four April events on critically important topics being presented in very interesting ways — hope to see you often between now and the end of the month.